Perhaps responding to a reduced appetite of the military, in the second half of 1961, engineers at Vladimir Chelomei's Branch No. 1 at OKB-52 conceived of a somewhat smaller, 500-ton, two-stage rocket designated 8K82. (134) To ensure military support, the rocket was promised to carry a powerful nuclear warhead and to be deployed in underground silos. The second stage of the UR-500 would be fashioned from the first stage of the UR-200. (209) It would employ engines borrowed from the first stage of the UR-200 upgraded for high-efficiency operations in vacuum and equipped with four steering mechanisms designed to move them in flight to adjust the flight trajectory. In May 1962, the project engineers now led by Yuri Trufanov finalized the architecture of the rocket which featured the first stage comprised of a central tank and six strap-on tanks. The second stage of was installed above the first. The diameter of 4.1 meters chosen for the core of the rocket was the absolute maximum for cargo transportable by rail even with the help of custom-designed carriage. 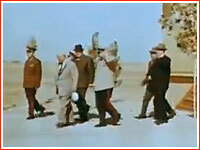 As a result, costly air transportation of stages to the launch site was avoided. (112) However, two-way railroads would have to divert incoming traffic in order to provide enough clearance for outbound trains carrying oversized stages of the UR-500. 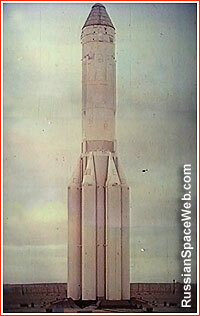 The preliminary design of the UR-500 rocket was completed in 1963 and it was immediately rushed to the manufacturer. First attempts to build UR-500 out of the new aluminum alloy known as AMTs caused a lot of grief for the engineers. They discovered that the material was too inflexible and brittle, leading to failures of new tanks during static tests. Cracks reportedly appeared in areas were tanks were welded together. Some components even cracked during prolonged storage. As a result, developers fell back to the heavier but more familiar AMG-6 alloy. The main designer of Plant No. 23 B.G. Britkov then led an effort to lighten various components of the rocket in order to bring the total mass of the vehicle back down to the original design specifications. The use of the older alloy also imposed temperature limitations on the UR-500, making it impossible to keep it fueled for extended periods under very high heat. In addition to manufacturing problems, specialists at Plant No. 23 were still struggling to complete major upgrades of their production lines in order to switch from aircraft and helicopter to rockets. As various development problems were pushing the first launch of the UR-500 farther and farther behind schedule, it was decided to start flight testing with a two-stage version of the rocket. Again, Chelomei considered military applications for the rocket. In 1963, his team issued a preliminary design of the 8F117 warhead compatible with Proton-K and with the AB-500 maneuverable aviation warhead. 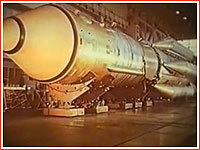 By the fall of 1964, most technical issues with the 8K82 rocket had been largely resolved, but politics intervened in a major way in the project. On October 14, Khrushchev was ousted in a bloodless coup, leaving Chelomei without his ultimate benefactor. The work on Chelomei's UR-200 missile was quickly canceled in favor of the R-36 missile, whose developer was based in Dnepropetrovsk, Ukraine, coincidently once the home town of the new Soviet leader Leonid Brezhnev. The UR-500 was clearly next to go on the chopping block. Ironically, just a day after Khrushchev's fall, a mockup of the Proton rocket intended for critical fueling tests was shipped to Tyuratam. After assembly and various checks at its Technical Complex at Site 92, the vehicle finally reached its launch pad in December. Along with fit tests of the launch complex, the rocket was to be filled with water to simulate all fueling procedures, however freezing temperatures in Tyuratam made the operation too dangerous. Instead, the project managers resorted to the second best -- 40-percent alcohol, essentially vodka. A total of 15 rail cisterns had to be delivered to the launch pad to fill the entire rocket. The first flight-ready version of the rocket appeared at the launch site in March of 1965 and, after four months of risky, trouble-plagued preparations and delays finally lifted off on July 16, successfully delivering the Proton-1 satellite into orbit. Despite this remarkable success, the creators of the UR-500 were not out of the woods either on the engineering or on the political front. The UR-500 would probably have been killed if not for the powerful head of the Soviet Academy of Sciences Mstislav Keldysh. Keldysh saw little use for the UR-500 as a ballistic missile, but did value its orbital launch capabilities. He decided to bank on the UR-500 as a vehicle that could carry Soviet cosmonauts around the Moon before the Americans could do the same. In August 1965, Keldysh chaired a commission tasked with scrutinizing the activities of Chelomei's OKB-52 and downsizing his projects when possible. 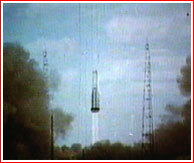 As a result, the UR-500 was officially "relieved" of its military duties (355), but the commission ultimately recommended that Chelomei continue the development of the UR-500K version as a space launcher and even spared his lagging LK circumlunar spacecraft, even though it clearly duplicated Korolev's L3 lunar landing project. On Sept. 6, 1965, the Minister of General Machine Building, Afanasiev issued an official order to submit to the ministry a schedule for the production of UR-500K vehicles. By October, the Soviet government reconfirmed its commitment to the development of the UR-500K, but it would now launch Korolev's stripped down version of the 7K (Soyuz) spacecraft to circumnavigate the Moon. (209) Chelomei's LK project was relegated to history. On Oct. 25, 1965, the Soviet government issued a decree formally consolidating the industrial efforts on the circumlunar mission with UR-500K-7K-L1 complex. On November 13, the head of the industry officially ordered Korolev and Chelomei to finalize the plan before the end of the year. Korolev's OKB-1 formally finished initial phase of the preliminary design of the 7K-L1 spacecraft on November 30. 1960 beginning of April: Engineers at OKB-52 design bureau draft plans for a A-series of launch vehicles. 1960 June 23: the Soviet government issues decree No. 714-295, (209, 509) formally approving the initial work on Vladimir Chelomei's 600-ton rocket among other space-related projects. 1962 February: Vladimir Chelomei introduces the UR-500 project to the Soviet leader Nikita Khrushchev during his meeting with military and defense industry official in Pitsunda on the Black Sea. 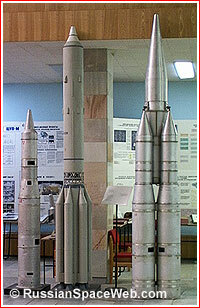 1962: Vladimir Chelomei's OKB-52 design bureau issues the preliminary concept (avant-project) of the UR-500 rocket. 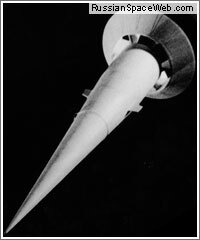 1963: Vladimir Chelomei's OKB-52 design bureau completes the preliminary design of the UR-500 (8K82) rocket. 1964 July 24: A full-scale mockup of the UR-500 rocket arrives at the launch site in Tyuratam. (233) The construction of the first launch pad (known today as "left" or Pad 23) for the UR-500 rocket in Area 81 is completed around that time. 1964 Aug. 3: The Central Committee of the Communist Party and the Soviet of Ministers issues Decree No. 655-268 assigning the OKB-52 design bureau to develop the three-stage UR-500K (8K82K) rocket for the LK circumlunar mission. (509) The development of a UR-500 ICBM is discontinued. 1964 Oct. 14: A bloodless coup in the Kremlin overthrows Khrushchev. 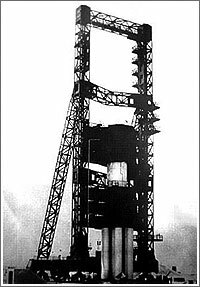 1964 Oct. 15: The fueling prototype of the UR-500 rocket is shipped to Tyuratam. 1964 December: The fueling prototype of the UR-500 rocket is installed on the "right" pad at Site 81 in Tyuratam for fit tests. 1965 June 30: Chelomei approves the preliminary design of the LK complex for the circumlunar mission around the Moon. 1965 Sept. 8: The Military Industrial Commission of the Presidium of the Soviet of Ministers issues Decision No. 201 allocating 18 launches of the 8K82K rocket for the L1 test flight program.